Blue Horseshoe Wishes You a Happy New Year! We tagged VSYM in yesterday morning’s premarket report and despite an early dip to a low of .0014, the stock made a heck of a bounce in the latter portions of the day. 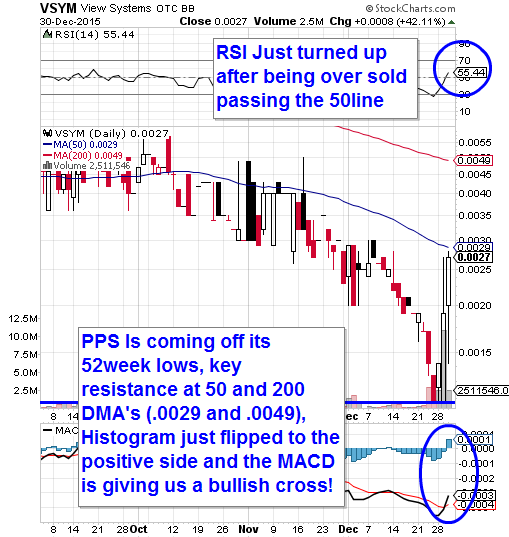 VSYM ran into the closing bell and ended just a tick below its high-of-day at .0028. It marked an intraday pop of exactly 100% and the move occurred on healthy volume to the tune of just over 2.5X the monthly average. CMRX grabbed our attention on Monday as we were noticing the massive 75% premarket selloff that was occurring. Failed clinical trials can be damning for a stock, but we felt as if the move was too reactionary and placed it on rebound watch. That figure was extended to 43% as of this morning’s premarket high of 9.19. Based on the activity we’ve tracked to this point, it’s likely that we’ll continue our observation of CMRX into the new year. We’ve made ourselves familiar with WTW ever since the news of Oprah’s involvement with the company hit the wires this fall. We had tremendous success with WTW options at that time, and the stock itself appeared on our premarket watchlist yesterday. It was a great time re-enter it into the mix as WTW ran from 20.63 to 24.22, marking a 17% move to the upside. We’d consider that quite an impressive single-session advance for $20+ stock. We also drew attention to the WTW $22 Calls in our live trader’s chat (which are currently free and open to all of our readers*) and those went on to make a stellar performance, running from .40-2.15 (+437%) subsequent to our signal. *Send a Skype contact request to ‘stocksumo’ to participate in our daily trader’s chats. In what is shaking out to be a characteristically slow short week for stocks in general, we’re going to adjust our focus a bit and turn to UGAZ. This triple-leveraged natural gas bull ETN has been gaining momentum and rebounding nicely off of its recently-established 52-week lows. We’ll look for UGAZ to continue registering higher lows and higher highs, and make its way toward the 50DMA of 3.06. 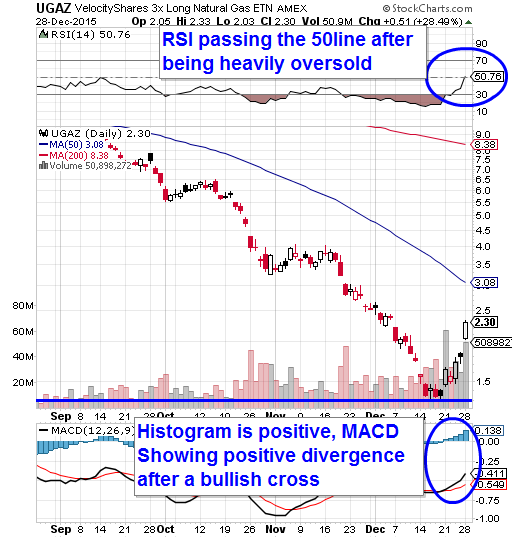 As we’ve pointed out on the chart below, there are a number of bullish indicators drawing our attention. We’d also consider this idea to have a seasonal advantage as we are heading into the two coldest months of the year; the time when natural gas consumption rate is at its annual peak. We’ll eagerly place this note on watch in coming weeks to see how it responds to rising natural gas demand. We placed FXCM on watch exactly two weeks ago and at the time, we observed a low of 6.68 in the stock and it never looked back. In the ten sessions since that alert, it has made some very impressive leaps and bounds. On Wednesday, we identified a pair of SAVE options contracts as potential swing-trade candidates, specifically referring to the January 15th $40 and $45 Calls, and over the course of the session and-a-half since then, they’ve made quite a bit of progress. From Wednesday’s lows to Thursday’s highs, we’ve already seen upswings of 48% in the $40′s (2.90-4.30) and 93% in the $45′s (.70-1.35). With more than two weeks until their expiration and SAVE shares still trading in the appropriate range, we’ll continue to keep a lookout for possible swing-trade chances from this particular options idea. Despite the decreased activity during the short week prior to the holiday break, we managed to spot some nice intraday swings from CELG options. We were on the trail of CELG Weekly $116-120 Calls starting on Wednesday, and after providing multi-bag gain opportunities on that day, they continued to produce during Thursday’s short session. The $119′s and $120 were both still close enough to the money to yield significant moves over the half-day with the $119′s surging 77% from 2.12-3.75, and $120′s making an impressive 204% run from .97-2.95. CMRX set off our cliff-diver alarms this morning after shares plummeted more than 75% in premarket trading based on the clinical failure of one of the company’s late-stage trial drugs. Whenever we see something like this unfold, our immediate instinct is to wait for the dust to settle, then strike as the rebound occurs. Knee-jerk selloffs of this magnitude don’t come along every day, but when they have in the past, we’ve almost always seen some measure of a recovery. We’ll place CMRX on watch for such an event, provided it can hold at or above the $7-level moving forward. PN is another stock that was recently hammered back, and its own recovery is already in effect. In addition to insider buying in recent months and coming off of recent lows on the chart, the company announced a significant share repurchase to the tune of $20M this morning (View PR) that will avoid dilution from a previously announced private placement. We’ll be monitoring the stock for the possibility of a protracted recovery as we kick another short trading week.